Well-run catalog companies possess ad-to-sales ratios around 10%. Common ratios are between 25%-35%. It's not uncommon to see a 40% ad-to-sales ratio. When the ratio climbs above 25%, the catalog brand is "owned" by the vendor community. Here's a poorly conceived flow-chart of who has power in the catalog industry. In the ecosystem, cash flows from bottom to top. A customer pays a catalog brand $100. The catalog brand keeps $5 cash (pre-tax profit) - and sends $33 cash up the food chain to vendors. 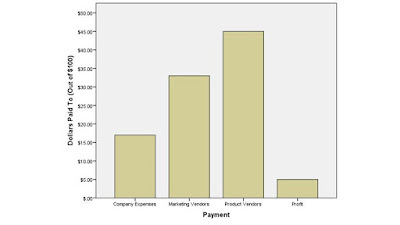 More cash goes to vendors than is kept by the catalog brand. Companies that own catalogers and/or catalog vendors harvest profit from catalog brands and/or catalog vendors. When viewed this way, the catalog brand is nothing more than an intermediary - a tool used by catalog vendors and owners to harvest profit from customers without ever having to do the dirty work of having to deal with actual customers. Catalog vendor partners are desperate to keep catalogers spending money ... think I'm wrong? Go look at the annual reports for Quad and RR Donnelley and the USPS. Quad's Annual Report ... (click here) sales are flat or declining, profit margins are razor thin, and they have a BILLION in long-term debt to pay but only generate four billion in annual sales. That's a problem. RR Donnelley Annual Report ... (click here) sales are flat or declining, and they have more than TWO BILLION in long-term debt to pay but only generate seven billion in sales and have lost money four years out of five. That's an even bigger problem. Here's the USPS ... a financial catastrophe. If I combine Quad and RRD ... I see more than eleven billion in annual sales and combined I see losses in four out of five years. And the USPS has run a fifty-nine billion dollar deficit over the past forty-six years. Paper, printers and the USPS usually comprise about 65% - 75% of catalog marketing vendor expense. Quad/RRD/USPS data above show you that your vendor partners are teetering, aren't they? So your paper-centric partners need you to keep executing what you've always executed. Mailing fewer pages or fewer contacts reduces their sales, and with the debt they're carrying, they're toast. That's how you end up with partnerships like this ... given what you read, it's hard to fathom that you're going to get unbiased information from this partnership, correct? So that's how paper folks / printers / USPS have to manage the situation. They need you to spend more on paper and printing ... their livelihood depends upon it. 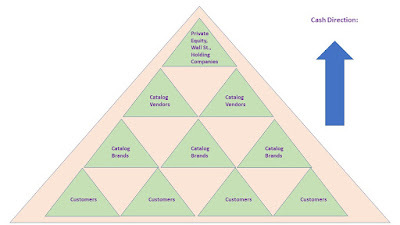 Now remember my pyramid above ... who owns Quad, and who owns their debt? Who owns RRD, and who owns their debt? Those folks are at the top of the pyramid. Wall Street, Banking, Private Equity, Government. Assorted vendors take a third of your operating cash on an annual basis and use it to generate enough cash to approximately break-even while paying down long-term debt. Without you, the ecosystem goes bankrupt. The relationships go outside of your print-centric vendors. Garnet Hill might pay Wiland money for co-op names. This allows Printer / Paper / USPS to get paid, which pays down their debt and can generate profit which gets Wall Street and Private Equity paid. Wiland's parent company is Brentwood Associates (Private Equity), who owns Soft Surroundings. Therefore, Garnet Hill is paying to fund future investment at Soft Surroundings, a competitor. Cash flows out of Garnet Hill and into the ecosystem benefiting Soft Surroundings. In the future, your catalog brand will have to be part of an ecosystem where dollars flow in. In this example, dollars flow out. Future investments at Soft Surroundings allow the USPS, Paper Folks, and Printers to get paid (again), flowing money up the pyramid. Any profit earned by Garnet Hill is captured by their parent company (Cornerstone Brands). Cornerstone Brands then funnels profit into Home Shopping Network (Cornerstone's parent company). HSN then funnels profit into QVC (HSN's parent company). Who owns QVC? Wall Street! Meanwhile, Soft Surroundings might take their cash and invest it with Abacus to purchase co-op names. Abacus earns profit from this transaction. To mail the catalogs, the USPS, Paper Folks and Printers all get paid (again - notice how these folks always get paid on a variable cost basis?). Abacus is owned by Epsilon. Data and Profit pass from Abacus to Epsilon. Epsilon uses the data to partner with Facebook - meaning that Soft Surroundings is indirectly paying Facebook to better target Soft Surroundings customers all across the internet for products likely to compete against Soft Surroundings. Who owns Facebook? Wall Street. Epsilon is owned by Alliance Data, a publicly traded company generating $6.4 billion in sales and 20% profit (yup, that's a lot). You are ultimately an intermediary who pays Abacus to pass data up the pyramid so Alliance Data can do a better job of targeting outside of the catalog industry and generate revenue. Think about that for a moment. Who owns Alliance Data? Wall Street! Soft Surroundings finds that their investment ends up benefiting Alliance Data and companies like Facebook. Any profit earned by Soft Surroundings filters up to Brentwood Associates. Who is Brentwood Associates? Private Equity!! Did you notice that Wiland presented at NEMOA - paired with a sister brand via their Private Equity parent? Undoubtedly they paid a sponsorship fee to get an opportunity to get you to spend money (with Wiland), money flows up to Private Equity and can then be reinvested across catalog brands they own (or wish to own). Your money goes out and is repurposed within the ecosystem. In the future, you will have no choice but to belong to an ecosystem where more money comes in than goes out. 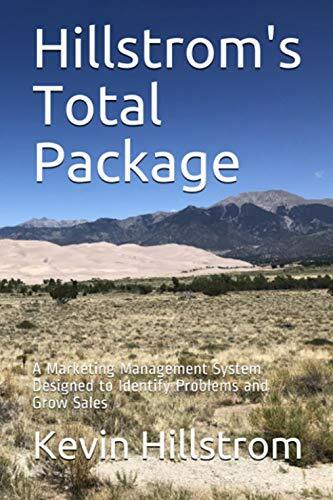 If more money goes out than comes in, then you have to increase merchandise productivity to overcome what is going out - and that is HARD work! Here again is the pyramid. Now, what do you think the response will be if I come along and demonstrate that low-cost / no-cost customer acquisition programs are something you should pursue? Do the tactics use paper? No? Then the tactics don't fit within the ecosystem. Our industry has been sold a message ... for more than twenty years now ... a message that leaves the catalog brand as nothing more than an intermediary ... passing money up the pyramid. Most interesting (to me) is that as the ecosystem took control over the catalog industry, catalog professionals left the industry to work online. 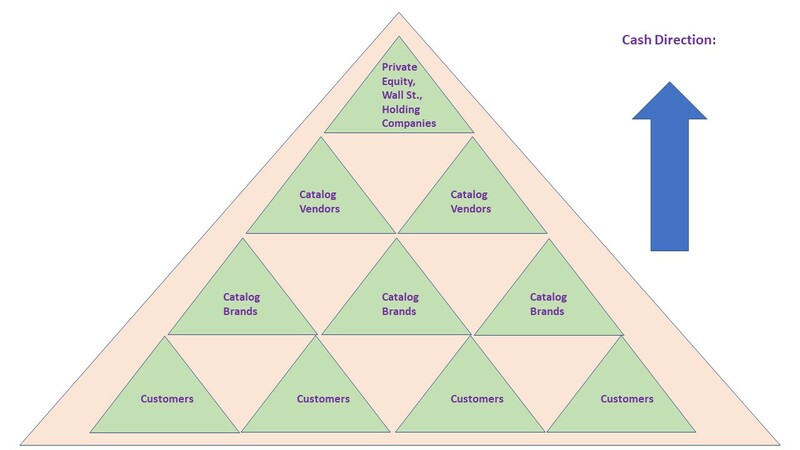 Many left in the catalog industry have only known this ecosystem, and enjoy obtaining guidance from those in the top half of the pyramid. This makes change very difficult - and the ecosystem requires this, because without cash from catalog intermediaries, vendors go out of business. To me, this explains why it is so darn hard to get a catalog brand to do anything innovative ... the ecosystem that passes money up the pyramid dissuades it from happening. It's likely that you disagree with me. How about sending me an email message (kevinh@minethatdata.com), sharing your thoughts? If your thoughts are logically composed, I'll be happy to publish them on this blog - even if your thoughts defend the pyramid structure outlined here.